Sometimes, our perception of the world changes. We notice new things, and these new things bring questions. For me now is such a time. Now, I sit on my trampoline, my favorite haunt for thinking. (don't bother asking why because I've no clue). It's been a slow perception-expansion as, over time, I've observed much previously unnoticed. My observations, though, have made my heart dull with a heavy sadness that's weighed down as if by tears that don't even have to strength to push their way through. I'm disheartened and, I dare say, maybe even a little frightened by this big world. I'm disheartened and, I dare say, maybe even a little frightened by the fact that a great portion of humanity is so anti-God. Evil likes to masquerade in a robe tinted with just enough light to cause questions of whether the darkness is really there. Only because of the darkness can we truly understand what light is, however, and I am frankly seeing how deeply complicated existence can be. Lately, it's been seeming like those robed in darkness can be awfully good at spreading light and living life as they seemingly live in a way devoted to... to living, for lack of a less elegant way to put it. Living with a confidence in the way they are living because life is life and life is meant to be lived. A confidence. An assurance. A more rich candor. (I am sorry if this all is a little unclear. Right now, I feel as though "my thoughts are stars I cannot fathom into constellations" (The Fault in Our Stars)). Lately, I've wondered why we Christians, in my experience, don't more often live in a more similar way since we actually have something (or more like Someone) to put our hope in. We actually have real confidence, a real assurance, and all the reason to live in a rich candor drowning in brotherly love. Furthermore, we live in a broken world which needs us to be all that we can for the sake of all who exist. 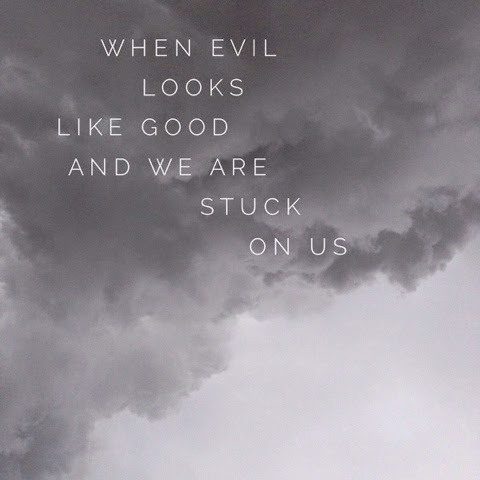 Lately, though, I have marveled over us, us so seemingly stuck within ourselves: focused on how bad we are and what a mess we are and how we just need to figure out our problems so that we can go and do good and how we are so insecure and how we are so unloved. Then, we hear how we are so loved and how we can be so secure and how our mess is okay and get fed all this warm, huggy mush meant to feed us but actually comprised of fluff which feels good going down but offers little propulsive fuel to drive us beyond our personal issues. Don't get me wrong; sin need to be dealt with, I fully agree, and these truths are extremely powerful. I feel that maybe they are sometimes overemphasized to our detriment, though. We are living in a broken world which needs us to be all that we can for the sake of all who exist. The concept of living for the sake of the world is not foreign to Christianity: "For God so loved the world that He gave his one and only Son, that whoever believes in Him shall not perish but have eternal life" (John 3:!6). Jesus lost himself for the sake of the world. Why don't we, then, turn from our own issues to our broken world hoarsely crying out its pleas for healing? Maybe it's not so much that we need to figure ourselves out but that we need to let ourselves go - let ourselves go, once and for all, surrendered into the arms of a Savior. Maybe we need to accept that we are flawed. We're imperfect. We're sinners. We're sometimes left without the answers and neat, clean fixes. Maybe we need to accept that acceptance of those things is okay, for, are we not to count all else as loss, anyway? "More than that, I count all things to be loss in view of the surpassing value of knowing Christ Jesus my Lord, for whom I have suffered the loss of all things, and count them but rubbish so that I may gain Christ" (Philippians 3:8). It's all counted loss in view of what? "The surpassing value of knowing Christ Jesus my Lord." "All this is from God, who reconciled us to himself through Christ and gave us the ministry of reconciliation: that God was reconciling the world to himself in Christ, not counting people's sins against them. And he has committed to us the message of reconciliation. We are therefore Christ's ambassadors, as though God were making his appeal through us" (1 Corinthians 5:18-20a). Maybe, what we really need to do is get our eyes off our grimy selves and actually realize with our hearts and not just our heads that this is true: all else but knowing Him and making Him known as Him ambassadors is loss. Yeah, we complain a good deal more than we should. Yeah, we judge when we have no right to and wear our masks to cover our perceived imperfections. Frankly, the world keeps spinning. It doesn't make much sense to be incessantly spending and undue amount of time berating ourselves. The world is spinning right. now, with you and your fleeting days contained within its atmosphere. The world is aching to be healed through the touch only you uniquely can offer. If you do not do so, it's yourself and the world who are going to suffer a loss. Please, forget yourself by losing yourself in His arms. Please, loose yourself for Christ on the world. It pleads for your healing touch.